World Golf Village’s Red, White & Boom celebration gives a new meaning to the term “dinner and a show!” In fact, the annual event offers one of the best fireworks displays in Northeast Florida. This year’s event will be held on Monday, July 3 with plenty of dining options before the big show. 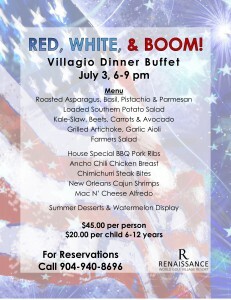 Villagio Dinner Buffet(6 – 9 p.m.) is $45 per person ($20 for kids 6-12 years old, 5 and under are free). Guests will enjoy traditional summertime fare like barbeque pork ribs and watermelon. 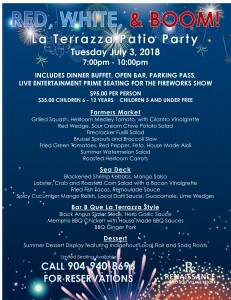 La Terrazza Patio Party(7 – 10 p.m.) is $95 per person ($35 for kids 6-12 years old, 5 and under are free). This package includes a special dinner buffet, open bar, parking pass, live entertainment and primo seating for the fireworks display! The buffet will feature a wide array of fresh summer veggies, seafood, barbeque and fun desserts. For reservations at either of the Renaissance restaurants, call (904) 940-8696. The café at World Golf Hall of Fame will also be open until 9 p.m. and additional food and beverages will be on sale throughout the grounds. 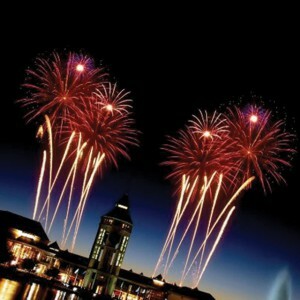 Show:The spectacular fireworks display begins at approximately 9:15 p.m. above the lake in the heart of World Golf Village. The fireworks show is free and parking at the event is $10. Arrive early and bring lawn chairs! Sorry, the IMAX Theater’s special Movie & Fireworks package is SOLD OUT. Visit WorldGolfIMAX.comto see other show times.